Born in Sante Fe, New Mexico in 1938, Joe Kapp is regarded as one of the toughest QB’s to ever play the game. Joe Kapp played his college football for the University of California, Berkley. Kapp led them to the 1959 Rose Bowl, where they lost to a powerful University of Iowa 38-12. After being drafted by the Washington Redskins, Kapp chose to sign with the CFL’s Calgary Stampeders. In 1961 the Lions entered into a major trade with the Calgary Stampeders, which was considered tby many to be a gamble by the Lions. In the trade, the Lions got quarterback Joe Kapp in exchange for four players. In return they got a QB who was coming off knee surgery. The Lions would finish that season with a dismal 1–13–2 record. In 1962, after an extensive rehab program for his knee and under new head coach Dave Skrien, the Lions finished the season with a 7–9 record. Kapp had an excellent season, throwing 28 touchdown strikes and passing for 3279 yards. He also added 183 yards along the ground on 51 carries.But it would be 1963 before theteam became real contenders for the Grey Cup under Kapp’s direction. Led by Joe Kapp and Willie Fleming, the Lions would end up finishing that season in first place (for the first time) with a 12–4 record. After a 2–1 series victory over the Saskatchewan Roughriders in the Western Finals, the Lions would play in the 51st Grey Cup game, in Vancouver at Empire Stadium, against the Hamilton Tiger-Cats. Kapp and the Lions would lose that contest 21-10. After the 1963 season, Joe Kapp became the first B.C. Lion to receive the Jeff Nicklin Memorial Trophy as the Most Valuable Player of the Western Conference. Kapp and the Lions would get their revenge versus the Tiger-cats the following season. They compiled an impressive 11–2–3 regular season record in 1964, and defeated the Calgary Stampeders in a three-game series in the Western Conference Finals. The team went on to win the 52nd Grey Cup game by a score of 34-24, and the first title in franchise history. 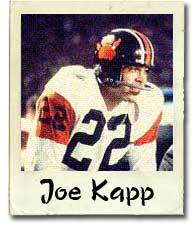 Joe Kapp was named to the CFL All-Stars on offence in that championship season. Prior to the 1967 season after two years of team decline, Joe Kapp left the team to pursue career in the NFL with the Minnesota Vikings. Kapp played a total of eight years in the CFL, initially with Calgary and for almost six seasons with B.C. He passed for 22,925 yards. In 1990, the Lions hired Kapp as the team’s new general manager. Following a blueprint that saw him recruit ex-NFL players such as Mark Gastineau who was a huge bust. Kapp was fired 11 games into the Lion’s schedule. His most notable achievement was the signing of quarterback Doug Flutie, who would star in the CFL over the next decade with most of those years playing for the Calgary Stampeders and Toronto Argonauts after a contract dispute saw him leave the Lions. Inducted into the Canadian Football Hall of Fame as a player in 1984. Inducted into the B.C. Sports Hall of Fame in 1999. Inducted into the University of California Athletic Hall of Fame. Twice an All-Canadian All-Star Quarterback. Kapp led the league in passing four years in a row from 1962 – 1965. Kapp’s #22 jersey is retired by the Lions. Joe Kapp was voted to the Honour Roll of the CFL’s top 50 players of the league’s modern era by Canadian sports network TSN.